Those of you who raised your eyebrows at the very idea of lentils mixed with chocolate might be forgiven for thinking that we have lost our tiny minds, that too long around infant children, cooing and a-goo-goo-gooing, has softened our already mushy brains beyond repair. Indeed, had we not gone out on a limb ourselves and given this a bash, I daresay we would be right there among you sucking our teeth and rolling our eyes, but, like many foods that turn out to be extra delicious, a small leap of faith is necessary. Rather like the sensation you experience shortly after realizing you put on your underwear inside out, eating lentils with chocolate is initially unsettling. That something as earthy and savory as lentils can work with luxurious chocolate is certainly a surprise, but a very dark, high cocoa-solids chocolate does have a distinctly savory quality, and I don’t have to remind you that until some bright spark mixed it with milk and sugar, chocolate was an exclusively savory product for centuries. The origins of this unusual dish are unclear, or at least we were unable to discover them using Google Translate, and we cannot lay claim to being its inventors, but a recent flick through some old photos reminded me that I had been intrigued by it a while ago. Those among you with long memories, may remember that back in the fall of last year, when we made the traditional Argentine dish locro de mondongo, we mentioned having eaten some Buenos Aires’ favorite empanadas at La Cupertina, a charming little cafe in the Palermo Soho district of that glorious city. And the especially keen-eyed may have noticed that in a photo illustrating said post featuring the window of said cafe the specialties of the house were listed, including lentejas al chocolate. Certainly not a common dish anywhere, lentils with chocolate can be found on both sides of the Atlantic in northern Spanish, especially Asturian, and Portuguese cuisine, as well as throughout Latin America. The lentils are usually served soupily with a humble garnish of fried, garlicky croutons and a good glass of red wine, but in our own unique, whimsical manner, we paired them with a monster pimenton-spiked pork chop, and attempted a strange kind of winter scene as a garnish, decorating the plate with steamed asparagus tip “Christmas trees” gaily adorned with festive ribbons made from roasted red pepper strips. In quite what role the roasted pearl onions were cast remains uncertain. Perhaps they resemble over-sized tree ornaments, perhaps not. Maybe we are going soft in the head after all. Drain most of remaining liquid from cooked lentils, leaving 2-3 tablespoons in the pot. Remove bay leaves, and sprinkle in chocolate. Stir well. Re-cover and allow chocolate to melt for 2 minutes. Stir, taste and correct seasoning. Serve with fat garlicky croutons or in a whimsical styling of your choice. Huh. I will trust you on this one… Certainly, the Mexicans got it right pairing chocolate with savory dishes (mole) as did the Italians (agro-dolce). When I was in Spain last month I had a foie gras truffle — foie gras mousse encased in a crust of dark chocolate. Given that I was at a Michelin one-star restaurant, I really wanted it to work… but it didn’t. @Julia – i’m totally with you. Culinary exploration often results in dead-ends. The key to this one is being careful with the chocolate. One can certainly have too much of a good thing! Very Dada-esque, both the dish and the plating! I like. I never heard of lentejas con chocolate before in my life! In Asturias? Amazing that I have to learn it from you ;). It sounds most intriguing. 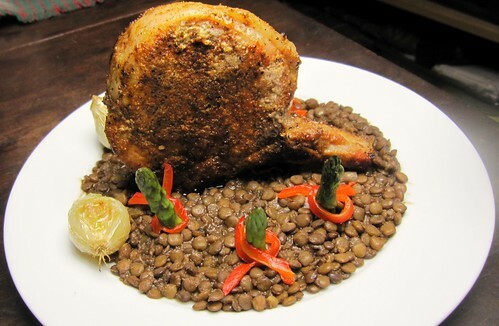 Your head may be soft, but the lentils look like they’re cooked perfectly. I just don’t know on this one, Jonny. I’d definitely try it if served to me, but I don’t think I’ll be making it. Best wishes to you, Amy and the little one for a happy holiday season and a great new year! P.S. When are we going to see a photo of him? You know, it’s not that weird at all. Mole with chocolate is delish with black beans so why not lentils??? I can’t help but think it would be wonderful with a grilled steak with lime… cool idea! The pearl onions would have made a good snowman, if you weren’t such a slacker. I can totally see the lentils and chocolate working with morcilla as a nice riff on the usual garlic sausage. Sounds like a good savory take on chocolate. Half of what size bar? In ounces would be helpful as I’m going to use my own cacao, ground fine. Love the idea! So rich and delicious!! I’ll never fault anyone for putting chocolate in anything. 🙂 I can see how lentils and chocolate would work well together. 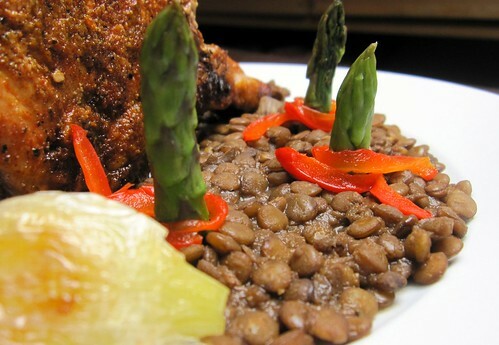 Chocolate in savory foods has a nice earthy quality that would pair well with lentils. I have a chocolate surprise of my own coming up, so I’m always pleased to see like-minded folk! How much chocolate did you use? Is a bar a standard unit? If so, how much does it weigh? @Olivier – thanks for the question, and apologies for posting the recipe unhelpfully, I’m correcting it right now. I’ll respond via email also. good quality choco makes all the difference. can’t tell you how many times i get asked why can’t i just use hersheys reg choco? the higher the cacao the more intense the flavor and actually the less you need for cravings & cookings. @vanilla – couldn’t agree with you more. particularly in savory applications, the higher the cacao factor, and the lower the sugar, the better the integration. Thanks for visiting! I think when you said “The lentils are usually served soupily with a humble garnish of fried, garlicky croutons and a good glass of red wine,”…Well, that put me over the edge. I’m intrigued.